Now, you may be reading this thinking, “Alan? Have you lost your mind! ?” Yes! Yes I have! But that this isn’t a new thing . . . and just by watching John Carpenter’s 1981 classic Escape from New York it got worse. But oh well. So, Escape from New York stars Kurt Russell as “Snake” Plissken. He is an ex-soldier and now legendary fugitive. When Air Force One is hijacked by a group of psycho terrorists, the President of the United States is kidnapped. Commissioner Bob Hauk tells his men to find him Plissken. After he is found, the commissioner makes him a deal. If Plissken rescues the President and retrieves a tape that contains important information on nuclear fusion, Hauk will give him a full pardon. However, Plissken must complete his mission before the international summit that the President must be at, in 24hours. If he does not complete his mission in 24hours, then two microscopic explosives that Hauk injected in Plissken will rupture his carotid arteries once the 24 hours are up. Of course Plissken goes through hell, and by the time his mission is done the 24hours are almost up. He is about dead by the end, with only three minutes to live. But, of course, our buddy Snake lives, and the President is found. Naah, he escapes from LA a few years later. Over all, the film is . . . overrated. When I watched I thought it would be a lot better than what I saw. I understand it was low budget, and it was the 80s, but some people call this “One of the best films of ever made,” and it isn’t. But it is worth a watch if you’re a fan of John Carpenter (Halloween, Big Trouble in Little China). A few facts about this film are interesting. 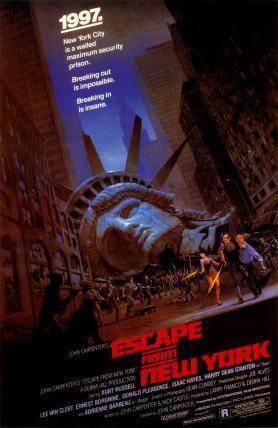 SNL did a skit called “Escape from Escape from New York” because of how bad they thought they film was. Another fact: Carpenter originally wrote the film in the mid-1970s as a reaction to the Watergate scandal, but no studio wanted to make it because Carpenter proved unable to articulate just how this film could relate to the Watergate scandal. After the success of Halloween, he had enough influence to get the film made. Also, most of the film was shot in St. Louis, Missouri, where significant portions of the city were used in place of New York City. It’s on Netflix! Go give it a watch at least once. It’s worth that.